Greeting motorists during the lunch hour at the intersection of Northern Lights Boulevard and the Seward Highway across from Sears in mid-town Anchorage, on August 18, 2014. Absentee and early voting for the November General Election begins October 20th. It's a convenient way to vote and beat the crowds on Election Day. Please encourage your friends and neighbors to get out and vote as this year's election is crucial. Polling continues to show Dan Sullivan with a lead from between 4-6%, which is encouraging. Since the election will probably be close barring a major unforseen development, the key to Sullivan's victory in November will be getting his supporters to the polls. Polls are volatile, so nothing should be taken for granted. The Alaska Dispatch News (ADN) reported today that several polls show Dan Sullivan in the lead over Begich, ranging from 2-6%. My decision to exit the race this month so as not to draw votes from Sullivan and unite Alaskans behind his candidacy to defeat Begich, could very well make the difference on election day. Polls consistently showed I was supported by 3-5% of voters. The ADN stated the following in today's story: "(Pollster Ivan) Moore said he saw two dynamics in the campaign that could have hurt Begich in the recent poll numbers. One was the withdrawal from the race this month by Vic Kohring, the Alaskan Independence Party candidate and former Republican state legislator whose supporters likely defected to Sullivan, Moore said. The second was the Begich campaign’s decision to run a controversial TV run that included a clip from the scene of a notorious Anchorage double homicide, which drew public objections from the family of the victims." Also go to News Articles for campaign-related press coverage. The September edition of "The People's Paper" is on the newstands, containing my article summarizing my recently concluded senate campaign. It can be found at newstands throughout the Valley and parts of Anchorage or online. I was interviewed today on KSKO Radio 870 AM from McGrath, discussing my recently concluded campaign including issues that remain a concern and what I hope to see addressed this election and in the new congress. I have withdrawn my candidacy so as not to risk drawing votes away from Dan Sullivan which could have easily tipped the election to Mark Begich in November. Polls show the race remaining tight, so it may go down to the wire with a few percentage points separating the winner from the loser. I ask Alaskans to join me in supporting Sullivan in a unified effort to elect a new senator. The August edition of "The People's Paper" has arrived on the newstands which contains my article on Obamacare, it's origins and the need to repeal the overbearing, harmful law. Copies are available in the Valley and Anchorage and can also be found online. Thank you to those who supported me at the polls, enabling me to prevail as the Alaskan Independence Party nominee and move on to the general election. The field has now been narrowed down to four candidates - Republican, Democrat, Libertarian and Alaskan Independence. 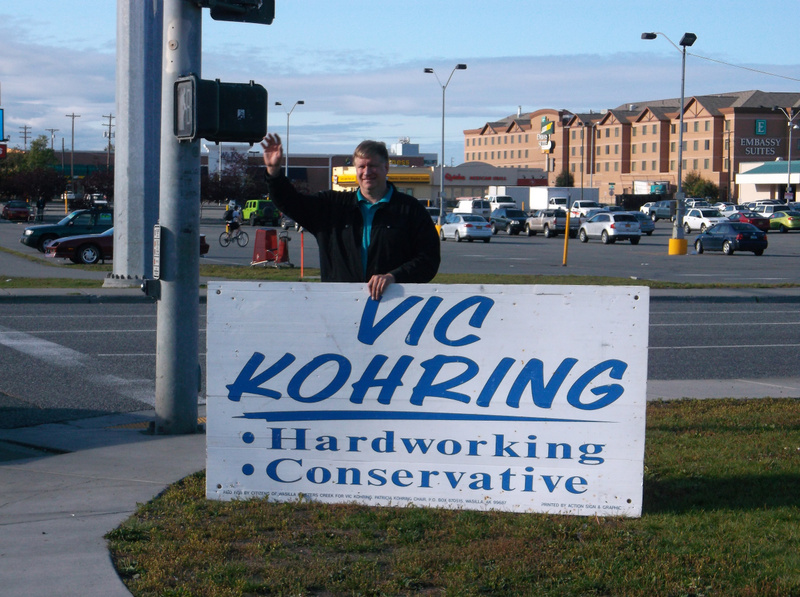 I made one final sign waving effort this morning - primary election day - in Anchorage. This time it was at the intersection of Benson Boulevard and the Seward Highway in mid-town. I joined a couple dozen "No to Ballot Measure 1" supporters. I too support retaining the existing oil industry tax law to encourage increased oil exploration and development in Alaska, the mainstay of our economy which funds 90% of the state budget. I sign waved in Anchorage today at three locations. First it was along the New Seward Highway beginning at 5:50 am. Then the intersection of Tudor Road and Lake Otis Parkway (Anchorage's busiest intersection), followed by East Northern Lights Boulevard and the Seward Highway/Gambell in the afternoon. The reaction of motorists was very positive. Today was "Candidates Day" at the Anchorage Baptist Temple. Candidates for public office were provided the opportunity to introduce themselves to the congregation and meet with voters after the service. ABT was gracious to invite me to participate which I was honored to accept. The service was broadcast on television on KTBY Channel 4 and can also be viewed on ABT's website at http://ancbt.org/Media/Index_ABT_Media.php. The Tundra Drums in Bethel and the Seward Phoenix Log newspapers both published answers to questions asked of me and my senate competition in today's editions. They can be viewed at http://www.thetundradrums.com/story/2014/08/14/alaska/candidates-address-concerns-before-primary-election-aug-19/1575.html. The reception recieved along the Glenn Highway this morning with my sign and flood light near Eagle River from 4:50 am to 8:15 am was excellent. Thank you for your honks of support! The Fairbanks Daily News-Miner published answers in today's edition to questions posed to U.S. Senate candidates on issues of concern to Interior Alaska. Go to http://www.newsminer.com/u-s-senate-vic-kohring/article_6d8a34c6-2714-11e4-a26c-0017a43b2370.html. I was interviewed by KCAM AM 790 in Glennallen, discussing what I hope to accomplish as a member of the U.S. Senate. Issues included the national debt, economy and oil and gas development. The interview can be heard at http://tunein.com/radio/KCAM-790-s31941/. The Alaska Division of Elections has posted on their website profiles and position statements of the various candidates for the U.S. Senate, myself included, to be published in this fall's Official Election Pamphlet (voter's guide to be mailed to all registered voters in the state). To view, please go to http://www.elections.alaska.gov/doc/oep/2014/cs/Vic_Kohring_USSenate.pdf. I was interviewed by KVRF FM 89.5 in Palmer for 30 minutes, discussing a variety of issues including resource development in Alaska, national security and court decisions regarding corporations. You can listen to the interview at http://www.radio freepalmer.org/2014/07/29/us-senate-interviews-continue. MSNBC's "The Last Word With Lawrence O'Donnell" requested my input on a court decision regarding Obamacare subsidies. This was my answer: The Washington, D.C. appeals court made the right decision which I'm hopeful will hold up in a subsequent court as the first major step in dismantling the Affordable Care Act. America needs to return to a fully market-based system where competition ensures quality health care at competitive costs. We should make sure that those who cannot afford health insurance are provided adequate health care through other programs including Medicare, Medicaid and other social programs intended to assist those of low income. To cite some examples in Alaska, the Anchorage Neighborhood Health Center is one facility where low-income, non-insured families can obtain quality care. Another is the Denali Kid Care program, a very generous subsidy health care program for children. Similar programs throughout Alaska and the country should be made available and fully funded for the needy - in lieu of Obamacare's socialized medicine, which is a proven failure in many countries. As I speak with Alaskans on the campaign trail, the biggest concerns include the need for infrastructure improvements - namely our highway system. Another issue is our state's inability to fully develop oil resources on the North Slope such as ANWR, due to federal restrictions. The national debt is also a major concern as is the weak state of the economy. Many people are dismayed with the lack of leadership in Washington and the gridlock in congress over partisan politics. Ballot Measure 1 has been in the news almost daily, the effort by anti-growth liberals to overturn Senate Bill 21 and continue gouging the oil industry with heavy taxes, to the detriment of jobs and economic growth. I strongly endorse SB 21 as the replacement for ACES to encourage more oil development, the life blood of Alaska's economy. Please join me in voting "no" in August to retain the existing tax law. I have filed as a candidate for the United States Senate as a member of the Alaskan Independence Party at the Alaska Division of Elections office in Wasilla. I'm a candidate because I have profound concerns about the direction of our country and the legacy we will leave behind for future generations of Americans.